As we approach the magical time of the Fall Classic, we’re reminded of the adage that defense wins championships. Adages, of course, gain their status by the tried and true measure of the passage of time. They just hold up. Watching the Giants lose to the Phillies the other night in the ongoing NLCS, we were struck by the undeniable truth of defense in the field: it’s all about the glove. No one is blaming their gear, but it was sub-standard glove work that cost the Giants this game. We’re not going to address the issue of Aubrey Huff’s, um, so-called lucky thong. You won’t find that in our gear guide. For everything else about baseball gloves, you know where to look. We love our old, game-tested glove, but nothing lasts forever. Old Faithful’s days are numbered. We just hope we can make it through the summer season. We’re trying out a few new gloves, and, while we’re excited about the new ones, they need to be broken in. There’s been talk on the forum about this, of course. Everyone has their own take on it. How do you break in your gloves? 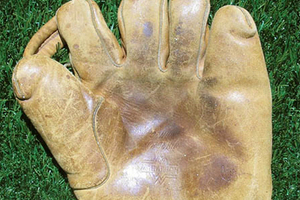 Anyway, back to the glove.Â When you put on, the “fingers” barely extend past my own, and doesn’t feature much of a pocket.Â The webbing consists of a lone strap of leather about 2 inches long between the thumb and index finger.Â Compared to modern-day gloves, the gloves from this era could not match the advantages players had with gloves made over the last 40-50 years.Â How much did this impact pre-1950 hitting stats when diving plays by an infielder were not benefited by gloves that extended an additional 3 to 4 inches and featured a deeper pocket and webbing?Â How many home runs are brought back into the park by outfielders reaching over the fence with over-sized gloves? 2 Summers ago we were at a huge antique fair in Upstate NY and saw these giant piles of baseball gloves…it was like Christmas Morning!